We are happy to announce some good news related to our cloud management solution for multi-vendor Wi-Fi Access Points. 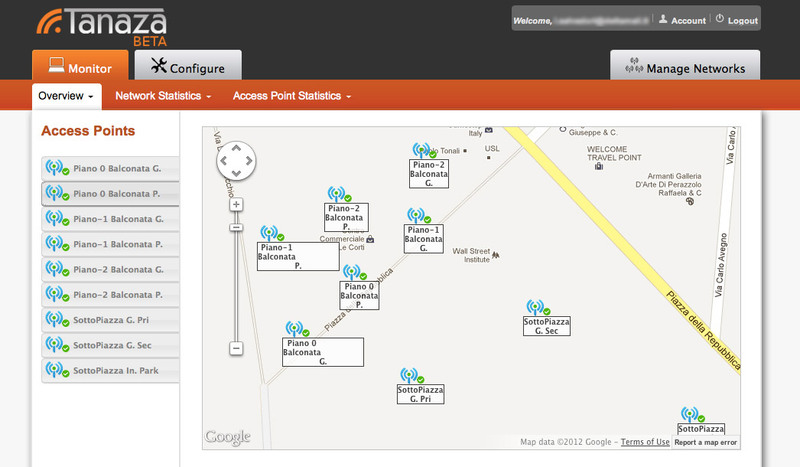 Breaking news 1 – Wi-Fi remote monitoring for ANY Access Point is now LIVE! Yes, you can see single AP statistics and net-wide aggregated statistics. You’ll also know if a device is alive or dead, thanks to a nice green/red bullet close to the AP icon. This works with all devices, provided they have SNMP (any version). Breaking news 2 – More models, more freedom! You are now able to cloud manage Wi-Fi devices by Netgear, Ubiquiti, TP-Link, D-Link, Engenius and Ruckus Wireless. For the complete list, just go here. The team is now working and testing Aerohive, Apple and other devices. We’ll keep you updated. Tanaza Powered APs, devices that have the freely available Tanaza firmware inside, will soon support Radius authentication. Stay tuned. We are almost there: we are working hard to develop compatibility for any OpenWRT device. If you are interested in this project, just let us know, writing to embedAT-nospam-ATtanaza.com.